On April 9, 2015, the Supreme People’s Assembly (SPA), North Korea’s parliament, met for its annual spring session. As usual, the Prime Minister gave an overview of the major economic achievements of the past year and the tasks ahead, and the Minister of Finance reported on the state budget for the previous and current years. Given the lack of official information about the economy, these publications, particularly the budget report, deserve our attention. This is one of the rare cases when the North Korean state provides quantitative information regularly, although the reports are rather short and do not always follow the exact same structure from year to year. If we contrast the 2015 budget report with the reports of the last few years, we find a number of noteworthy points. Food production was emphasized as the key area of North Korea’s economic policy by Prime Minister Pak Pong Ju both in his report on the past year’s achievements and in his outlook for 2015. He singled out the new stock breeding facilities on the Sepho tableland as a key project. As far as we know, North Korea plans to import cattle from Mongolia to be raised there. This would be a first in North Korean agriculture which so far has depended on pigs and chicken as the main sources of meat. Kim Jong Un sticks to the tradition of having annual budget reports issued. This is the fourth time under his leadership that the budget has been published. This was done at the same occasion and in the same format as under Kim Jong Il. The April parliamentary meeting and the budget disclosure have thus been firmly incorporated into Kim Jong Un’s own routine of governance. Unfortunately, he maintained the tradition since 2003 of publishing only percentage changes, no absolute numbers. Kim’s economic ambitions appear to have become even more modest, at least in comparison to his father. We could also say they are more realistic. 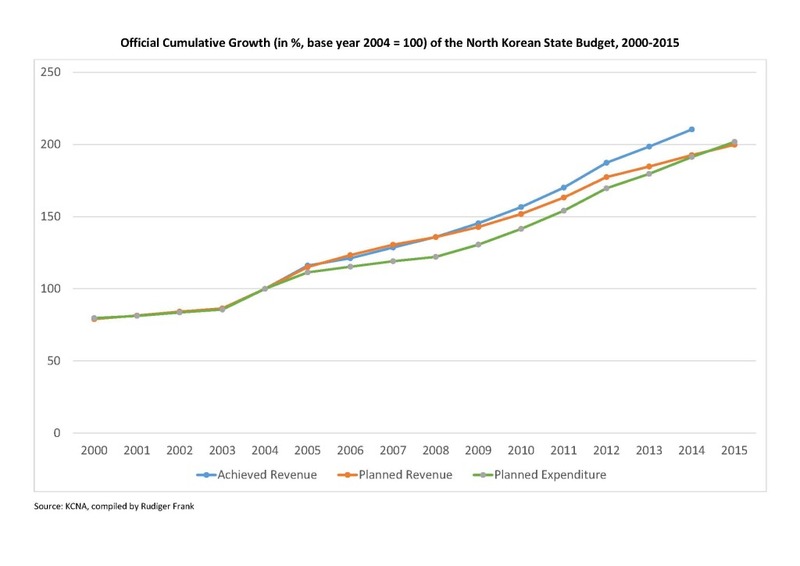 The position “state budgetary revenue” can roughly be seen as an equivalent to a GDP, given the fact that the North Korean economy is owned by the state. The growth rate of that revenue is therefore more or less an equivalent to an official GDP growth rate. As graph 1 shows, the trend of a substantially reduced rate of growth of planned state budgetary revenue started in 2013 and continues in 2015. In fact, 3.7 percent is the lowest such figure since 2002, the year of the July measures. Planned expenditure continues to grow faster than planned revenue. As graph 2 shows, in 2015 the cumulative growth rate of planned expenditure for the first time since 2004 surpasses the cumulative growth rate of planned revenue. This opens room for speculation: How do the North Korean economic planners intend to bridge that gap? No economy can spend more than it earns without receiving corresponding inputs of financial resources. As far as we know, North Korea receives no substantial loans from foreign or international financial institutions. There might be reserves, but these are limited. One possible answer would be that one-way transfers from the outside fill the gap. While remittances from the Chongryon in Japan have been almost stopped, the export of labor to Russia, China and the Middle East may be a possible source of such revenue. Another option would be income from activities that are not included in the official state budget, such as the second (military) economy or what is generally called “illicit activities.” Finally, since we do not know whether foreign trade is included in the budget figures, a trade surplus could also be a source of finance to bridge the gap between revenue and expenditure. However, according to the trade data compiled by KOTRA, North Korea has actually run a trade deficit of roughly $1 billion in the past years. So either KOTRA’s data is incomplete, or trade is not the source of income we are looking for. 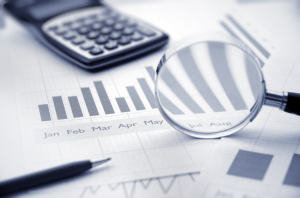 Last but not least, since the revenues usually exceed the plan, the gap between planned expenditures and planned revenue could simply be covered by over-fulfillment of the plan. For the second time since 2014, income from Special Economic Zones (SEZs) has been mentioned in the budget report. With +3.6 percent projected, it is expected to grow slower in 2015 than in the previous year (+5.1 percent). This is remarkable, given the fact that in 2014, more than a dozen new zones have been designated, and the wages for workers in the Kaesong Industrial Complex have been raised. Do we see here a reflection of decreasing optimism regarding Chinese economic cooperation? Or do North Korean planners just expect to invest more into the development of the new zones this year before they turn out a profit in the future? The share of national income derived from “local” entities, such as cities and provinces, has grown further. In 2011, they were projected to contribute 16.1 percent to the budget; for 2015, this figure has increased to 21 percent. The sentence, “Provinces, cities and counties are expected to ensure expenditure with the revenue from local sources and provide profits to the national budget,” further indicates that the central state seeks to delegate more responsibility to the local levels. Local industries played a major role during China’s early reform period. We should watch out for similar developments in North Korea. For the first time since I began examining North Korea’s state budget reports, fisheries and forestry are mentioned separately. The state plans to spend an extra 6.8 percent and 9.6 percent on these two fields, respectively. This highlights their strategic importance. Profits from real estate rent, which showed an unusually high projected growth in 2014 of 9.5 percent, are back to normal with 0.7 percent, the lowest such figure since 2011. We can only speculate what that budget position actually means, as officially all real estate is owned by the state as is the economy; would the state rent to itself and list the income as profit? This is not very likely. Perhaps this position refers to real estate that has been rented to foreign companies. Another possible interpretation would be the introduction of a de facto real estate market where quasi-private or collectively owned entities can rent land from the state. Because of the strong fluctuation in its value, this budget position deserves attention. But so long as we know so little about its actual meaning, drawing conclusions is difficult. The so-called priority sectors of the national economy, such as metal, power, coal and railway, have for the first time since 2009, not been mentioned in 2015. Their projected growth rate had already been substantially lower than usual in 2014, with only 5.2 percent compared to 12.1 percent in 2012. Still the North Korean state is investing in these fields: the production of juche steel (using only domestic resources, no coke) and the upgrading of the country’s transportation network are listed as priority tasks elsewhere. But, the absence of a corresponding budget figure is noteworthy. The growth rate for expenditures on sports has been reduced substantially after what now looks like a one-time boost in 2014, when it was projected to increase by 17.1 percent. For 2015, the state plans to spend 6.9 percent more on sports than in the previous year. This is still an impressive growth rate, reflecting the newly acquired interest of the leadership to improve North Korea’s soft power by successful participation in international sports events. As I wrote in 2014, this approach reflects a “normalization” of North Korea, since most former socialist countries of Eastern Europe followed the same strategy. 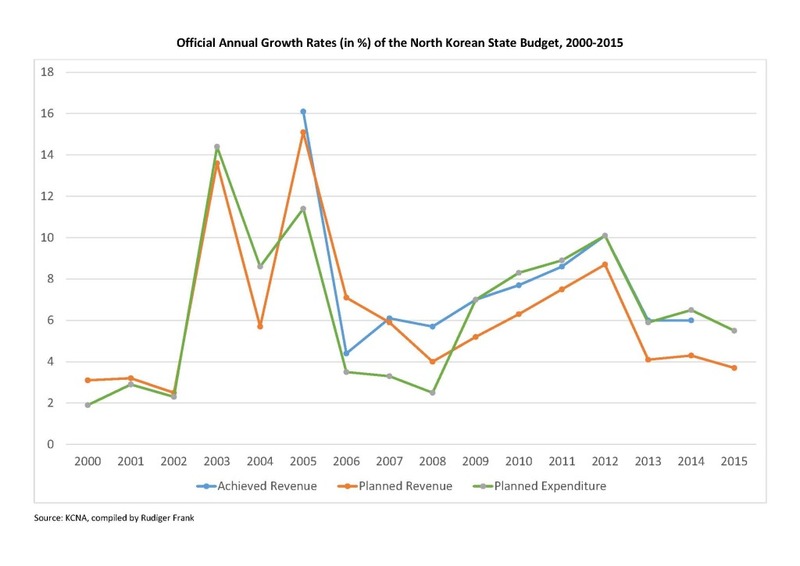 To conclude, the variations in the composition of the budget report and in the projected growth rates of single items suggest that there is some dynamism in Pyongyang’s domestic economic policy. Although we do not completely know the meaning of the single positions, we see shifting priorities and more realism. However, in principle, the structure, form and contents of the budget report more or less follow the tradition of the last decade. Beyond a few potentially hopeful details, we find no indication of a serious economic reform. 내각 지난해 사업정형과 올해 과업 보고-최고인민회의 제13기 제3차회의 (cabinet report on last year’s work and the tasks for this year – third session of the 13th Supreme People’s Assembly), http://www.kcna.co.jp/calendar/2015/04/04-09/2015-0409-032.html. 2015년 국가예산 보고-최고인민회의 제13기 제3차회의 (2015 state budget report—third session of the 13th Supreme People’s Assembly), http://www.kcna.co.jp/calendar/2015/04/04-09/2015-0409-034.html. A note of caution is due here. The reliability of official information from North Korea is generally questionable, as the state regards any such data as strategic. Furthermore, the part of the economy that is owned by the military (the so-called Second Economy) is excluded from the state budget. We need to assume that the latter is not the only position that is not considered in the official budget calculations. KOTRA (2014): 2013년 북한 대외무역 동향 (trends in North Korea’s foreign trade in 2013), Seoul: Korea Trade-Investment Promotion Agency; numbers for 2014 are expected in June 2015. For my analysis of the 2014 budget report, see https://www.38north.org/2014/04/rfrank042314. The projected growth for profits from real estate rent was constantly below 4 percent in the previous years. There are anecdotal reports about a very vibrant unofficial real estate market, especially in Pyongyang. What is traded there is not property, but the right of use. However, it is unlikely that proceeds from such activities are included in the official state budget.